The beautiful natural Harbour at Stornoway in the Outer Hebrides has been recognized as a haven for nearly a thousand years. With the stunning grounds of the Lews Castle as a backdrop, the magnificent scenery of the Outer Hebrides is evident on first arrival into Stornoway, the only town on the archipelago. The Town center is only a short stroll away from where you are docked or mostly tendered in (ships over 140 meters). The Isles of Lewis and Harris are at the North west corner of the group of Islands known as the Hebrides, or Western Isles. The Hebrides are known as the "long island" as they stretch for 100 miles. Stornoway is the main port on the Island, due to its sheltered location with the ferry to Ulapool a regular visitor. The sheltered harbor is the reason for Stornoway's existence and was named by the visiting Vikings "Steering Bay" which, when phonetically translated, became the name Stornoway. Lews Castle. Overlooking Stornoway harbor, the impressive Lews Castle (not Lewis Castle) was built in the mid 1800's by a rich merchant called Sir James Matheson of the Jardine Matheson company. Sir James bought the island of Lewis in 1844, developed this wonderful woodland area and built his mock Tudor castle. Lord Leverhume bought the building, complete with the island, in 1918, and in 1923 gave it back to the people of Lewis. Following completion of refurbishment in 2016, the Castle is now open to the public. It accommodates a fantastic museum of the Western Isles' history and culture; has a restaurant and conference center. It is well worth a visit! 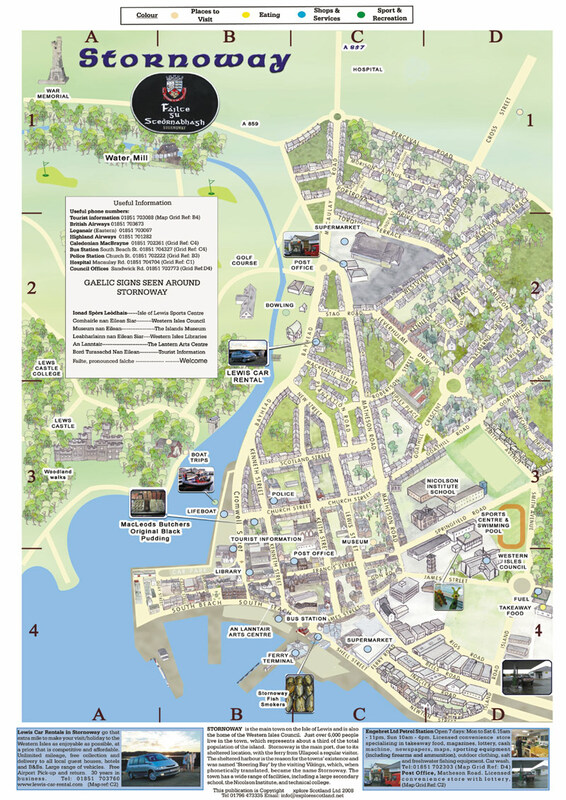 The Port of Stornoway is the gateway to an island steeped in history. The Standing Stones of Callanish and the Broch at Carloway are recognized among Europe’s most famous ancient monuments. Traditionally constructed Black Houses and Norse Mills are situated within easy reach of the Port. The local delicacy is Stornoway Black Pudding, a blood and oatmeal savory sausage product. All shops are closed on Sunday. The Outer Hebrides are one of the few remaining strongholds of the Gaelic language, as evident through the traditional music of the isles and the frequent use of the language by locals. The language even features on street signs around the Hebridean islands.